As part of National Hospice Month in November, the entire care team at Hope Hospice is committed to providing community education about hospice care so that you, your family members and loved ones have all the information you need - even before you need us. Hospice is not a place but is a program of comprehensive care and services that brings the patient and family the medical, emotional and spiritual support they need during life's final journey. We are passionate in our belief that nobody should suffer needlessly. Our palliative care programs are specially designed to ensure comfort and dignity. For the team at Hope, hospice care is about adding quality to each individual's life for as long as possible, whether days, months or even years. In fact, national studies confirm that those facing a life-limiting illness who seek hospice care actually live better and longer. Enhancing an individual's quality of life means they're better able to enjoy the company of family and friends during their time in our care, whether it's sharing a meal, an art therapy session or even a walk in the park. These interactions and experiences help create lasting memories that can help to ease the pain of losing a loved one. Hope Hospice is committed to providing quality hospice care and support to patients and their families in whatever place they may call home - a private residence, nursing home, assisted living facility, or one of our four Hope Hospice houses, which are designed to embrace the entire family in a homelike setting. Eligibility for hospice benefits often begins sooner than you think and is typically available much longer than you might expect. Talk with your doctor about the options for hospice as soon as a life-limiting diagnosis is made. It's important to know that Hope Hospice cares for every individual facing a life-limiting illness, regardless of age, illness or ability to pay. Nobody is denied our care due to lack of insurance. While losing a loved one is a natural process that each one of us will likely experience numerous times in our lives, coping with each loss can be extremely difficult without loving support. Hope Hospice offers grief and bereavement services to family members - including programs specifically for children - as well as to the community. Hospice serves people of all backgrounds, traditions and religions, and allows them to be with their families while receiving care. Emotional and spiritual support are available to help ease the transition and are tailored for each individual's personal needs. Hospice care need not be something that we fear; rather, having an understanding of how hospice can enhance the quality of each day of life can help us embrace hospice to ease the transition for our loved ones. Taking time today to learn more about the benefits of hospice can help each of us care for our loved ones with kindness and compassion through quality hospice care, whenever that time may come. For more information, call us at 482-4673. 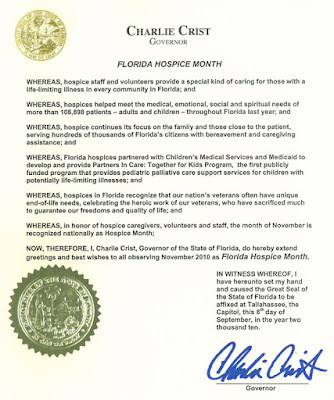 Visit HopeHospice.org to learn more about the month-long series of community events that are helping us celebrate National Hospice Month. Samira K. Beckwith is president and CEO of Hope HealthCare Services, a nonprofit, 501(c)(3)-status community-based agency offering programs and services in Lee, Charlotte, Collier, Hendry, Glades, Desoto, Highlands, Hardee and Polk counties. These fellow Americans have made profound sacrifices in defense of freedom and they deserve our heartfelt thanks and appreciation. Honoring our nation's Veterans includes supporting them throughout their entire lives, especially at the end. As our nation marks Veterans Day 2010, the National Hospice and Palliative Care Organization deepens its commitment to increase Veterans' access to the compassionate, high quality care available from the nation's hospice and palliative care providers. NHPCO has been a long-time supporter of the valuable work being done by the Department of Veterans Affairs to bring palliative care services to VA Medical Centers and the communities they serve. This past month, NHPCO in collaboration with the VA, took a great step forward to help healthcare providers better serve Veterans at life's end by launching the website www.WeHonorVeterans.org, the centerpiece of the new We Honor Veterans campaign. This campaign will help those who provide care at the end of life, better understand the unique needs of our nation's Veterans. But there is something that every American can do to honor and serve our Veterans - and that is to say, "thank you." Not just on November 11 but all year long. Ask your friends, neighbors, coworkers and others in your community whether they have served in the military (you may be surprised how many have) - and thank those who have served for their sacrifice. A generation of World War II and Korean War Veterans are facing end-of-life care decisions now, and they are quickly being followed by younger Vietnam War Veterans, many of whom are confronting serious illnesses at an even earlier age. It surprises many Americans to learn that every day, 1,800 Veterans die. That's more than 680,000 Veterans every year - or 25 percent of all the people who die in this country annually. If you know a Veteran who is in need of the special care hospice and palliative care brings to people facing serious and life-limiting illness, please reach out and help them learn more about care options. Information is available from NHPCO's Caring Connections at www.caringinfo.org or by calling the HelpLine at 1-800-658-8898. To all our nation's Veterans, thank you. 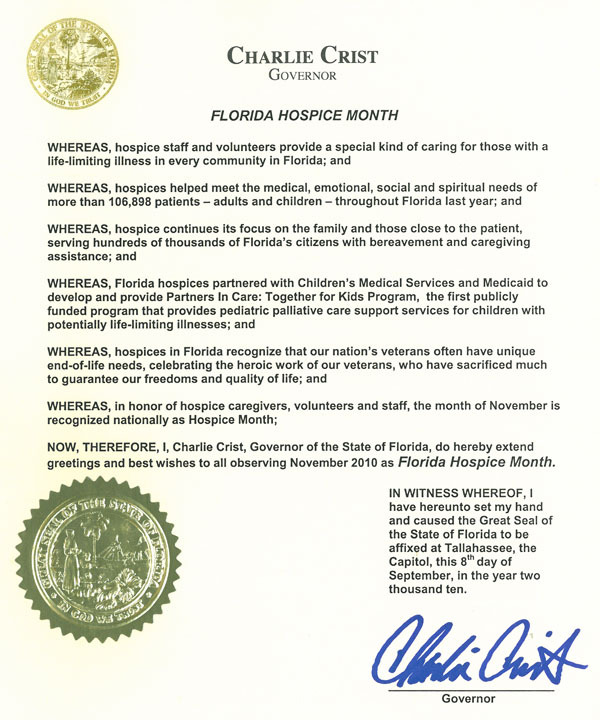 Ice cream, art, chocolate and yoga are only a few of the ways the Southwest Florida community can celebrate National Hospice Month and support Hope Hospice in November. Hope Hospice has partnered with local businesses such as Bistro 41, Norman Love Confections, and California Pizza Kitchen to create “Celebrate Life and Give Hope,” a month-long offering of events and programs supporting Hope Hospice. A portion of the proceeds from the month’s activities directly benefit Hope Hospice, helping the nonprofit organization continue its mission of providing comfort and care for people in life’s final chapter and their families. Hope’s special care is available to everyone, regardless of illness or ability to pay. Florida Gulf Coast University has taken the LEED to ensure its campus and the buildings on it are green-friendly. The university is following a national trend of sustainable development, under guidelines set by the U.S. Green Building Council. The purpose behind LEED, or the Leadership in Energy and Environmental Design certification system, is verification that a building is designed and built to save energy, increase water efficiency, reduce CO2 emissions, improve indoor air quality, and demonstrate stewardship of resources. It goes up by credits and guidelines met, from basic certification to LEED silver, gold and finally platinum. Achieving LEED certification was a a key element in the school's signing of the American College and University's Presidents' Climate Commitment, a promise by the institution to take "actions to make climate neutrality and sustainability a part of the curriculum and other educational experience for all students." Donna Henry, dean of the College of Arts & Sciences, oversees Academic Building 7, which received the highest ranking last month. "It's very exciting," Henry said. "Instead of saying it was too much money, architects to the majority of workers in construction all backed this, saying it was the right thing to do." The 62,000-square-foot, four-story building houses labs for physics, biology and chemistry as well as math labs, specialized research labs and a Geographic Information System computer lab. It also accommodates offices, conference rooms and a 160-seat lecture hall. Environmentally sound elements include high-efficiency light fixtures, windows and insulation that reduce energy requirements by 18 percent, saving more than $50,000 annually; a high-performance reflective metal roof; and shade overhangs and high-efficiency bathroom fixtures that reduce water usage. Even the building's landscaping was designed to be drought resistant and incorporates native and Florida-friendly plants that will need no watering once they are established. FGCU is not alone in its quest for LEED certification. The 46,604-square-foot Hope Hospice center on Beth Stacey Boulevard in Lehigh Acres was completed earlier this year. The Kraft Construction project was built with sustainable practices and has been submitted for LEED certification. Folks with Hope Hospice are waiting to hear about certification on its recently completed center on Beth Stacey Lane in Lehigh Acres. The 46,604-square-foot project was built with sustainable practices and includes a 10,000-gallon underground storage tank and backup emergency generator, enabling the facility to safely operate for several weeks during emergencies, such as hurricanes. There's also solar-powered signage at the entrance to the center, another way to conserve energy. "When we planned the construction of the Hope HealthCare Services Center, we wanted it to be energy-efficient and environmentally friendly," Beckwith said. "We wanted to be good stewards of our resources." LEED certification is not just for academic buildings and hospice centers. Restaurants, cafes and grocery stores, it seems, are in an all-out race to be green. A Subway shop in Chicago -with its tile, crown molding and most wall coverings made from recycled materials - is a first of its kind in a major city for the chain. In the bathroom, sensors control water flow, timers manage lights, and the toilet has a low-flow option. A smart air-conditioning system normalizes temperature between the bread ovens and the eating area. A Dominick's grocery store, also in Chicago, has been rebuilt from the ground up with sustainability in mind. The store, in the Lincoln Square neighborhood, features high-tech, energy-saving equipment, such as heating and cooling systems tied into sensors that normalize temperatures from the bakery to the frozen-foods section. Starbucks, meanwhile, has vowed all of its new, company-run stores will meet the U.S. Green Building Council's LEED standards by year-end. A variety of factors have encouraged green buildings. Subway and Dominick's, which is a division of Pleasanton, Calif.-based Safeway Inc., cite a slight improvement in the economy, and some cities, like Chicago, have streamlined the green permitting process. But, most important, stores almost need to go green to retain and grow their customer base, said Robert Passikoff, founder of Brand Keys, a consultancy that measures customer loyalty. He said consumer interest in a corporation's environmentalism is five times greater than it was a decade ago. "It's one of those things you can't ignore," Passikoff said. Green buildings, he said, resonate with consumers even more than corporate pledges to recycle or purchase carbon offsets. All things being equal, the customer will choose the green company, or the milkshake from the green restaurant, he said. From a business perspective, motivations for building green appear to be threefold: energy savings, customer goodwill and marketing. Passikoff noted that going greener is just the first step. "The issue isn't just doing it, but doing it believably and communicating it believably," he said. "Right now, if I told you BP is doing a heck of a job with the environment, would you believe me?" A company's commitment to going greener, he said, "should be part of the entire brand equity approach," integrated into everything from advertising to public relations. Savvy retailers such as Starbucks know this and believe it's a reason customers may pay more for their coffee. The chain also certifies free-trade coffees and touts its relationships with farmers in the world's coffee-growing regions. Its store-design strategy has become another extension of the same message. Dominick's sees a link between going green and building goodwill. "A lot of what we've done is based on requests from consumers," company President Don Keprta said during a recent tour of the store. "Everyone is very conscious of the greening of the country."